SELECT SIZES ONLY. SEE MANAGER FOR DETAILS. 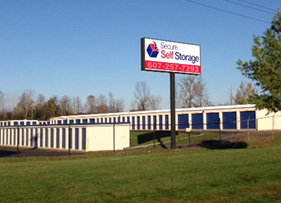 Secure Self Storage in Ithaca, NY, is the convenient choice for local residents, students and business owners. With mini-storage options and complete security coverage, you’re sure to find the right solution to meet your storage needs. Our convenient Royal Road location and flexible leases make us ideal for Cornell University, Ithaca College and TC3 students. Ready to try us out? Come in today find out about our latest deals and to get started. 5′ x 15′ (75 sq. ft.)* Large Closet Small amounts of furniture, sofas, chairs, chest of drawers, boxspring and mattress, business supplies and records, plus other small items and boxes. 10′ x 10′ (100 sq. ft.) Half of a one-car garage One-bedroom apartment with major appliances, other furniture and supplies. 10′ x 20′ (200 sq. ft.) Standard one-car garage A three-bedroom house with major appliances, plus lots of boxes. Business storage files and inventory ideal for storage racks. 10′ x 30′ (300 sq. ft.)* Standard two-car garage A four- to five-bedroom house with major appliances and room for boxes. Excellent for business storage of files, equipment and permanent records. This unit holds: Personal items, clothes, boxes, children’s toys, small furniture items, business records, and sales rep materials. This unit holds: Small amounts of furniture sofas, chairs, chest of drawers, boxspring and mattress, business supplies and records, plus other small items and boxes. This unit holds: One-bedroom apartment with major appliances, other furniture and supplies. This unit holds: A two-bedroom apartment or house, including appliances, boxes, and miscellaneous items, and commercial storage inventory. This unit holds: A three-bedroom house with major appliances, plus lots of boxes. Business storage files and inventory ideal for storage racks. This unit holds: A four- to five-bedroom house with major appliances and room for boxes. Excellent for business storage of files, equipment and permanent records. This unit holds: A five-bedroom house with major appliances and room for boxes. Excellent for business storage of files, equipment and permanent records. 4.11 out of 5 stars based on 47 reviews on sparefoot.com.